Now may be the time to stock up on some laundry supplies over at the commissary. 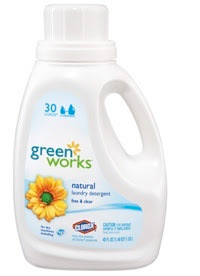 Green Works Natural Laundry Detergent (30 Loads) is priced around $5.50 so print the $3.00 off 1 coupon found here and you can snag this for only $2.50 (that's less than $0.09 per load!). All Liquid Laundry Detergent Free & Clear 2X, Fresh Rain 2X, Stainlifter 2X, and Secret Garden 2X (32 loads) are all priced around $2.99. Use the $1.00-$2.00 off 1 coupon from the 10/4 RP or print the $1.00 off 1 coupon here...this means cheap laundry detergent as low as $0.99! Many of the McCormick Gourmet Spices are priced at $1.49...there is currently a $1.00 off 1 coupon here which makes these spices only $0.49 each! What a great time to stock up for all that holiday baking! There is a new printable coupon available for $1.50 off 2 Ore Ida French Fries found here...you should still be able to find the Ore Ida Extra Crispy Easy Microwavable Fries priced between $0.50-$0.79 so this coupon makes them FREE or just pennies!